Being an Aquarian I very quickly took to water. 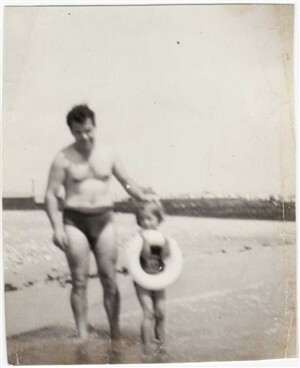 When aged 8 I was taken to North Road swimming baths with the rest of the class on Thursday mornings. Being a complete idiot I jumped straight in. I sank quite rapidly but the teacher Percy (Pop) Chandler thrust a pole down to me. Being the only thing I could see and panicking quite profusely I grabbed it. It must have been OK because I am still here! Time went by and when I was 13 I practically lived my weekends there. One Saturday I dived off the first board (after a fashion). I was gazing soulfully at the second board when a middle-aged lady came over to me. "You're dying to try that second board", she said, "aren't you?" I nodded and she said "come with me and I'll have you diving off of the top board before the afternoon is over." 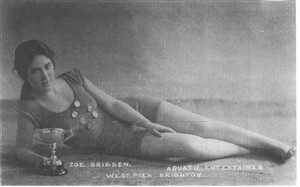 I did not know at the time she was Zoe Brigden who gave diving exhibitions off of the West Pier and was presented with a cup once by royalty there. I conquered the third board OK, but that top one was quite daunting to me. After much coaxing and my shoulders being pulled straight from behind, swearing vehemently I just went off. Not a good entry but I had done it! "There you are", she said, "now all you need is to stay straighter through the air". I was in there every day after that and Mr Robinson coached me for weeks at the same time he was coaching Jean Caplin, who swam for us in the 1948 Olympics. I was entered at 16 for a diving tournament, it was only a small Boys' Brigade one but I won it for the 6th Brighton Company. Zoe Brigden was on the balcony cheering as loud as any. When first married, we lived in Roedale Road and working on the building I was sent for a job further up the road. Much to my surprise it was Zoe Brigden and her sister, they were part of an undertaking firm "Brigdens". One mate that watched me was a lad called Kale (or Kail? Or Cale? ), who lived in the Gloucester Road area. I would love to find him again. He used to clear the bins from Western Road restaurants and lived somewhere in Hangleton. This page was added on 28/07/2007. This is such a lovely piece and so interesting. For me it has very personal meaning as Zoe was my grandmother's cousin and I have been seraching for information on her and her family, with a view to re-establishing contact - for many years now. My grandmother died quite young and her children, including my mother, were raised in separate families and had very little contact with any of their BRIGDEN relatives. I have recently been contacted by various relatives of Zoe and myself but Zoe's immediate family are still elusive although I know her son lives somewhere in Australia now. Zoe was a local amature swimming champion and gave diving exhibitions for many years on and near the West Pier. I have a couple of photos of her and hope to get one posted here for all to see. Either the date is incorrect, or the picture of the man with the little girl circa 1960 is not Man Mountain Dean. Everything I've read about him says he died in 1953.